The Bermuda Economic Development Corporation [BEDC] held its second annual Future Agro Challenge [FAC] on Wednesday, January 13 at the Department of Environmental Protection, with Omari Dill winning the competition, and Marcus Wade placing as first runner up. A spokesperson said, “FAC was designed to help identify solutions to the complex global challenge of feeding the world’s growing population. By identifying innovators that have creative solutions to their own national problems, FAC seeks to highlight social entrepreneurs across regions and bring them together in order to preserve the future of agribusiness. 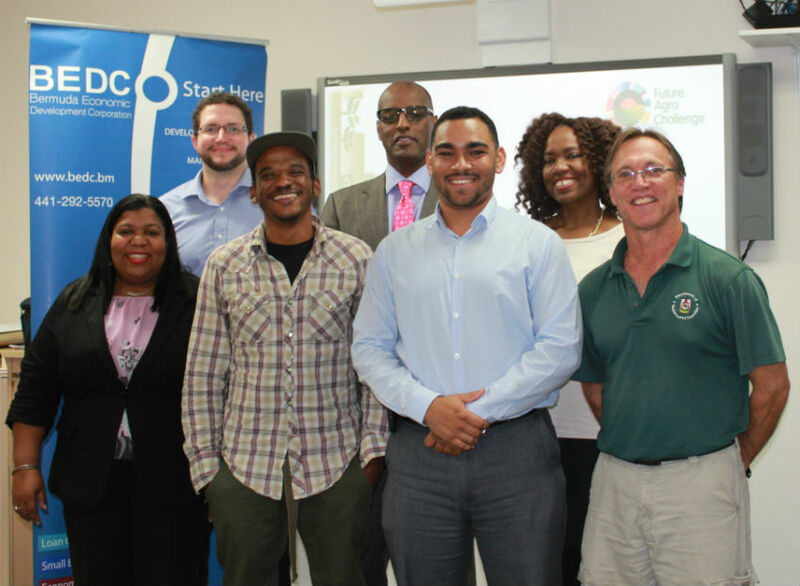 “The local competition sought to identify entrepreneurs that are actively working to create and maintain a vibrant agro culture in Bermuda. “The final competition came down to two young, ambitious, agro-entrepreneurs pitching their business ideas: Marcus Wade, Wade’s Garden Foods, utilising vertical aeroponic technology to supplement the traditional farming practices in Bermuda and Omari Dill for Utopia with his sustainable agriculture and edible landscaping consultancy. “The competition’s judges included Thomas Sinclair, The Government Agricultural Officer with the Department of Environmental Protection; Jonathan Starling the Executive Director of Greenrock; and Curtis Dickinson, Executive Vice-President of Butterfield Bank and Head of the Bank’s Group Capital Markets & Treasury Division as well as BEDC’s Deputy Chairman. “Thanks to our gracious sponsors, The Department of Parks and the Department of Environmental Protection, the Bermuda National winner will get a chance to pitch their idea, at the global finals in Medellin, Columbia during the Global Entrepreneurship Congress in March 2016. Last year, Bermuda won big, with Bermuda Aerial Media taking home the top prize of €7,000. Well deserved…A great way to start the new year and Omari I wish you much success. Hands down you are very knowledgeable in this area. Well done Omari and Marcus! Congratulations to these inspirational environmentalists. We need you in our world and hope this helps you see a way forward to continue your work locally and overseas. Well done recipients! Way to go Marcus! Does anyone know how I can reach out to Omari Dill? I would like for him to help me to start my own vegetable garden. Many thanks! Congratulations Omari. Way to go. Wishes you the best in the final in Colombia.